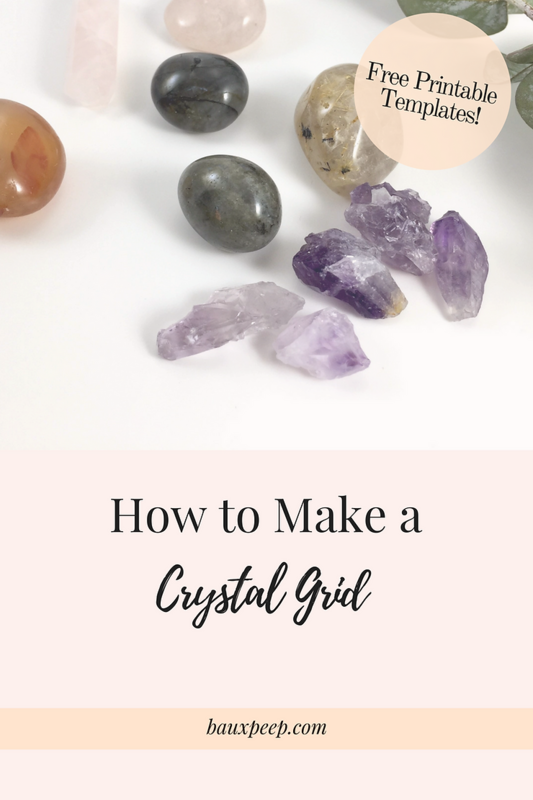 How to Make a Crystal Grid -- With Free Printable Template! Crystal grids are basically super refined transmitters of energy. They attract positive vibration through their alignment with one another. Grids are more powerful than meditating with singular crystals alone. 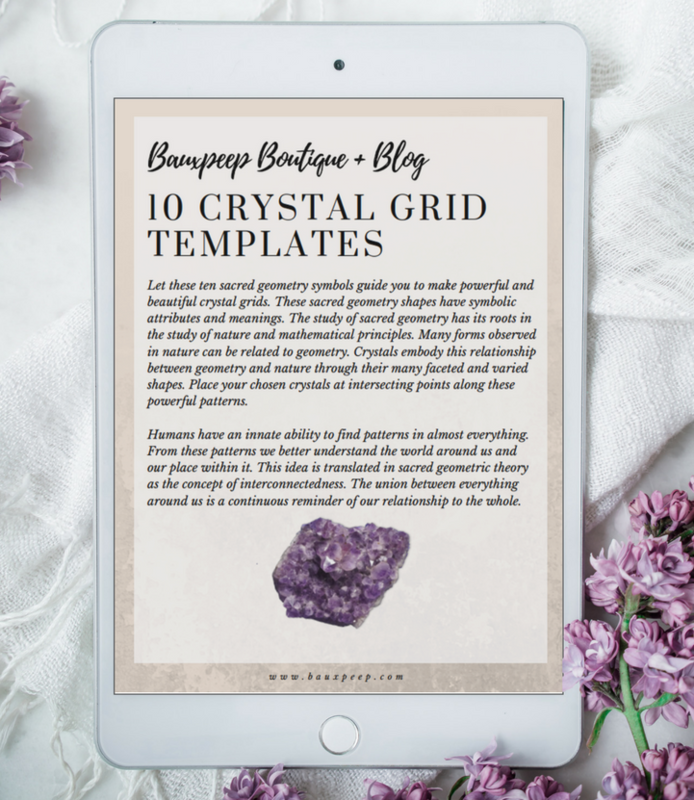 There are many ways to use and make crystal grids, but today we will focus on a simple, but powerful version anyone can follow and use anytime. Grids use the combined power of complimentary crystals to harness the properties you are seeking through intention. They direct their special energies toward whatever you wish to manifest by relaying off of one another to a central beacon (or generator) stone. A simple crystal grid can be used quickly when you don't have the time to complete a full grid. Below is an example of a grid for a new relationship. The Rose Quartz in the middle represents love and relationships. The 4 Labradorite stones represent new beginnings and the crystal Quartz stones in alternating directions seal the grid drawing negative energy away and positive energy inward. A simple crystal grid using Rose Quartz, Labradorite, and Quartz. Notice the Quartz points alternating-- drawing negative energy away and positive energy inward. For this instruction we will be using a simple Flower of Life sacred geometry grid. You can get this grid directly to your inbox here. This free and easy printable will be the basis of our grid. Follow along with the explanation below and you'll be making your own crystal grids in no time! Make sure your chosen crystals have been cleansed and charged. You will also want to spend some time with each crystal aligning them to your specific intention. Crystal grids are a way to use all of your individual crystals together to super charge your manifestation! Related: A Guide to Charging Your Crystals: the easy way! Your generator stone can be any crystal. Chose the one most closely related to your intention. For example; we would use an Amethyst central to a grid where our intention was to strengthen attributes of the mind. Similarly a Chrysocolla crystal central in a grid where our intention was to open ourselves to communication. Lets expand on the idea of a central Chrysocolla crystal. If our intention was to open ourselves to communication within our close relationships; we would choose six pieces of Rose Quartz (the relationship stone). To place in the six points around the center stone. Don't have six pieces? That's fine! You can use two on either side of your central crystal. From here we would seal our grid with six Crystal Quartz stones. Crystal Quartz are important to any crystal grid. They attract potent energy into any manifestation. They amplify your intention and promote your overall well-being. This is why they are the most used and beloved stone of all. You see them so much in jewelry for this very reason. If you don't have that many stones place your quartz crystals on the two points parallel to the central stone. Create more grids by using the intuitive design of Sacred Geometry. Learn the basics of Sacred Geometry and get 9 more golden grid templates. This guide is easy to use in PDF format. Print your grids in the comfort of your home. Crystal grids are powerful and easy to make. They beacons of positive spiritual energy. For maximum potency; build your grid in a sacred space in your home on the night of a new moon. Keep your grid for a full moon cycle, visiting with it each day to meditate on your intention. On the day of the full moon celebrate your manifestation! Take this opportunity to cleanse and charge your crystals to ready them for a new purpose.